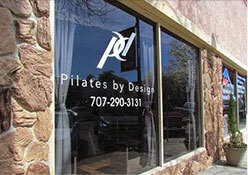 Adriana discovered Pilates about 7 years ago while working as a Physical Therapy Aide. Amazed at all the exercises you could do on the Pilates equipment, she has been fortunate enough to work side by side with a great Physical Therapist that has a broad knowledge of Pilates and has taught her the importance of stabilizing and strengthening the body in order to prevent injuries without adding any strains to the joints. After incorporating some basic exercises on the reformer with injured patients she started to notice how well they were responding to Pilates and decided to sign up for the BASI Comprehensive Pilates Certification program. She has been teaching for 2 years now and has enjoyed witnessing patients and clients get stronger and would love to share all of the amazing things Pilates has to offer with you!